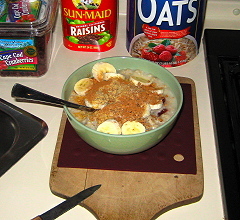 My aversion to oatmeal has stuck to me as tenaciously as mother's oatmeal stuck to my ribs back in the day. I'll bet you remember the stuff - a glutenous glob sitting in a puddle of milk with some brown sugar tossed on it. Ughh!! It's taken over 50 years of eating some pretty bad oatmeal to get up the gumption to overthrow mothers presence in the kitchen and make oatmeal my way. We've had our coffee. Let's talk oatmeal. At the time I developed this recipe I thought oatmeal was a good thing and that it deserved a place on the table now and then. Now that I've moved on to a low carb diet I'm not so sure. But I'll leave it here for those who might enjoy it. John's pretty good oatmeal isn't your mother's oatmeal. This is post-mother's oatmeal. Oatmeal for the new millennium. Oatmeal with some kick. A lighter, punched up oatmeal. 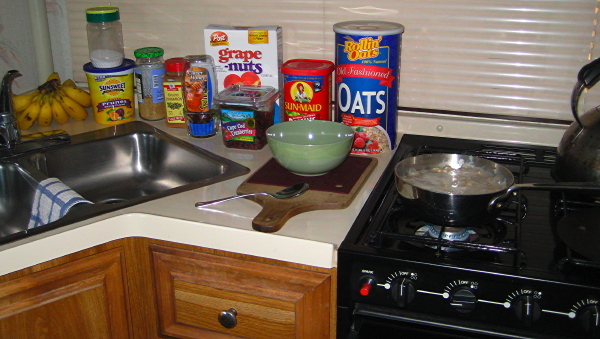 Rolled oats - preferably organic rolled oats from your favorite health food store like . When I travel more often than not I've been stuck with whatever I can find locally, usually that old Quaker box or its generic equivalent. Raisins or Prunes - Whatever I can find - usually Sun-Maid - but again, organic would be better. As long as we're punching up the oatmeal we might as well punch up the quality of ingredients as well. Dried cranberries - for snap and tartness. Honey - how do you train honeybees to produce organic honey anyway? Salt - Sea salt might be nice here. Water - MORE water than mother would ever allow, almost enough to make soup. Enough that the cooked oatmeal can't form a glutenous glob you have to dig out of the pot; enough that the cooked oatmeal will pour from the pot to the bowl. Experiment until you get it right. Put the pot on the stove and bring it to a boil, shut the heat off and cover the pot for a few minutes to let it steep. Decant the resulting thick oatmeal soup into your favorite cereal bowl. Banana - there's good stuff in a banana. Again I like organic when I find them. Kashi Nuggets - for crunch. I much prefer Kashi Nuggets but have not found them everywhere. Hence the Grape Nuts today. Flax seeds - ground, a tablespoon will do - for some omega-3. Cinnamon - for whatever that is good for, I forget now, but it's supposed to be a good thing. Key #1 - to John's pretty good oatmeal - get free of that glutenous glob. Key #2 - is to punch up the texture and flavor with stuff mother never used. I haven't gone very far here today but you get the idea - lighten it up and punch it up. Excuse me, my oatmeal is getting cold.